State Sen. Ricardo Lara (D-Long Beach) introducing a bill in 2014 that sought to make Medi-Cal available to anyone in the U.S. illegally who met the income requirements. The legislature did not pass that measure; the final 2015 version of the bill only expanded Medi-Cal to unauthorized immigrants under 19. Starting next month, California will become the first state in the nation to make its version of Medicaid available to children in the U.S. illegally. The state Department of Health Care Services estimates that about 170,000 kids under 19 without legal status will be eligible for Medi-Cal under a law passed last fall. Half of those expected to enroll live in Los Angeles and Orange Counties, according to experts. The expansion will cost an estimated $40 million the first year and about $132 million annually in the future, according to Health Care Services, which oversees Medi-Cal, the state’s health care program for the poor. “These people are our community, they deserve health care and housing that is their right” said Enrique Montoya, a La Raza activist. While Medi-Cal is the state version of the federal Medicaid program, California will cover the cost of care for unauthorized immigrant kids, since they are ineligible to receive federal funding. 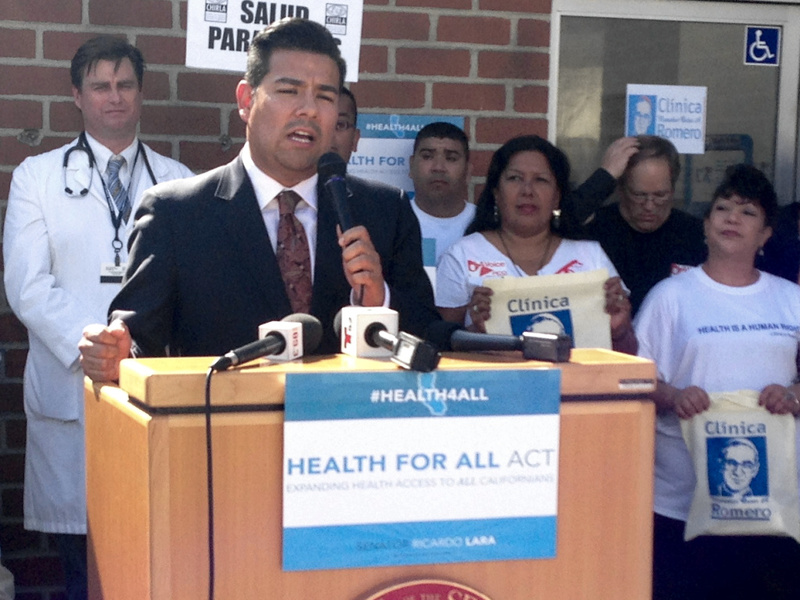 “We will not rest until ALL migrants regardless of age get free health care” said Enrique. Children in families earning up to 266 percent of the federal poverty limit are eligible for free or low-cost Medi-Cal; the income limit is currently about $64,000 a year for a family of four. Officials have had some logistical difficulties enacting the law, but they expect it to go into effect May 16. Coverage will be retroactive to May 1. Senator Ricardo Lara (D-Bell Gardens), who authored the law, said moving low-income children without legal status to Medi-Cal will save taxpayers money. Critics disagree. They argue it is too expensive, it could cause immigrants without legal status to put down deeper roots in the state and it could encourage more people to come here illegally.